In recent years, trappers in the northern Rockies and Great Lakes Region have been given the opportunity to trap the gray wolf. We get some pro pointers from a veteran Canadian wolf trapper. In the past five years there has been an explosion of opportunity for hunting and trapping wolves across the U.S. First in the West, then in Minnesota, Wisconsin and Michigan, the chance to take a wolf appeared for the first time in nearly a century. This has led to a hunger among outdoorsmen for information about how to hunt and trap these amazing but wary canines. In this first of two parts, I will examine strategies and techniques for trapping and snaring wolves; in part two, I will cover hunting over bait and predator calling. The best way to learn how to catch a wolf is to look to those who have been doing it. In Canada and Alaska, wolves have not had the protection they’ve known in the Lower 48, and many hunters and trappers have developed and refined techniques that have served them well. 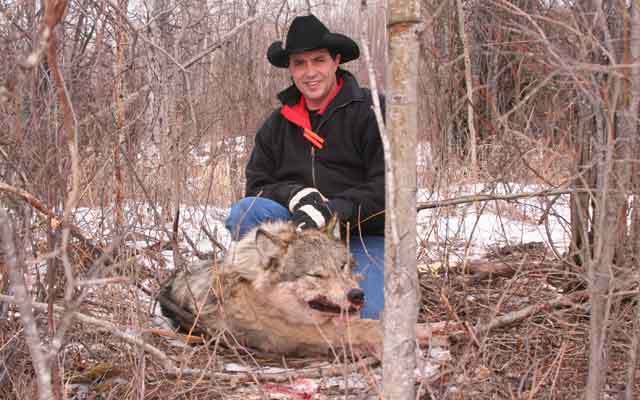 Alberta’s Gordy Klassen is recognized as Canada’s premier wolf trapper. He travels around Canada giving wolf-trapping seminars both privately and for government animal control agencies. He offers what he calls a college course in wolf trapping and hunting each year, and the week-long event is booked well in advance. They figure things out very quickly, so you can’t make mistakes. You rarely get more than one chance at a wolf. One of the keys to the equation is scent control. He uses Scent Killer spray when he sets traps and never touches any equipment with his bare hands. He is careful to never breathe on the snare or trap and even chews spearmint gum to avoid the smell of his breath in the area while constructing a set. “One drop of sweat will ruin the whole deal,” he says, so he even uses sweat bands on his head and arms when trapping in warm weather. His equipment is clean and free from human scent or foreign odors. He uses a product called Insta-Boil to boil the scent away from the equipment and adds some pine, balsam or spruce to the mix to give the equipment a natural smell. When making a snare or trap set, Klassen uses a clean ground cloth to stand or kneel on. Then when a catch is made, he uses a tarp to roll the animal up and carries it out of the area. He says if there is any blood in the area, other wolves may avoid it, so he shoots the wolf behind the ear and then quickly rolls it onto the tarp to avoid blood on the ground. Dragging the wolf out might offer the animals a clue as to where it went, so that’s a no-no. Even in the winter when there is a great deal of snow cover, the caught wolves are carried out of the area, not dragged. The wolf’s amazing ability to smell is also his undoing. Wolves are very attracted to the scent of any canine that is not a regular visitor to their hunting area. Urine and feces from wolves outside their home range is the best attractor possible if you can get it. Klassen says many serious wolf trappers have set up exchanges where each collects feces in sealed bags which they can trade to trappers from other areas. These are then used for bait at wolf sets. The typical sets that trappers use to catch the smaller canines also catch wolves. Fox and coyote sets like dirtholes, flat sets and urine post sets all work. Bait stations are one of the most effective ways to snare wolves. When the going is tough, wolves will come to fresh bait and are vulnerable to properly set snares around bait stations. But Klassen doesn’t do things in the order that you might think. Rather than put out a bait and surround it with snares as the trails develop, he chooses an area for the bait and sets the snares first. He tries to anticipate the wolves’ approach to the bait site and sets 20 to 30 snares around the area in any possible trail. After a few days, any human scent that might be on or immediately in the area of each snare has dissipated. He then brings in the bait. Snaring wolves in winter is made easier by deep snow. Wolves will follow the path of least resistance, even if it is a snowmobile trail. Setting snares in these trails and in places where he has shuffled his feet to create a trail can be very effective. The same is true of game trails, but snares must be used with great caution where other animals are using the same trails. A simple set that has accounted for a lot of wolves in the winter involves nothing more than a paper cup with a couple of tiny holes in it filled with urine and suspended so it slowly drips onto the ground. Snares are set in foot-trails around the scent. You can add stool from outside the area for extra appeal. “Wolves spend 95 percent of their time on the fringes of their territory,” Klassen says. “They like trails and roads and will follow these. Power line cuts and rivers are also followed.” The edges of the territory will be defined by such a feature, and the wolves make regular trips along these boundaries. Lakeshores, cliffs, swamps and other barriers that are difficult to cross often make up the edge of the territory. Or it might be something like a logging road. Once you find one of these areas, the sign will be abundant. Wolves will leave droppings and urinate every couple hundred feet along the boundaries of their territory. Tracks from regular use will be visible. Of course, it stands to reason that these are the high-percentage places to set your traps, and the time it takes to find these boundaries is well worth the effort. Snares are made of either 1⁄8-inch or 3⁄32-inch galvanized aircraft cable. Klassen primarily uses 3⁄32, 7x7 strand cable in 60-inch lengths. He then adds a swivel and another 60 inches of cable that leads to the anchor point. He is very specific about the particulars of his sets. He makes the snare loop 19 inches in diameter and sets it 18 inches above the ground. A plastic collar is used directly above the lock so the snare is held firmly in place. A support wire is held firmly in this collar. He “loads” his snares by bending it with his fingers so it drops quickly upon first contact. He claims most of his snares hit the wolf right behind the ears and it’s lights out very shortly, because the arteries that lead to the brain are affected. No blood to the brain means the wolf basically goes to sleep within seconds.If the snare misses slightly, the wolf might be alive for some time, collared like a pet. But wolves have very sharp teeth and their jaws can exert 1,100 pounds of pressure on a snare cable. It might take some time, but it’s possible the wolf could chew the cable in two. Klassen prevents that by anchoring the snare high or to the ground, so the lock settles either on the back of the wolf’s neck or the throat area, and he cannot get his teeth onto the cable in either case. The RAM Power Snare in the Wolfmaster model is used where no anchoring is available. Klassen uses this setup exclusively where sign shows that the wolves are crossing beaver dams, one of his favorite places to snare them. This snare has a large spring that triggers when a wolf enters the snare, quickly closing it. Foothold traps used include the Bridger Broad, the Alaska #9 and the 76 LAY, which is his favorite because it is center swiveled and tough, and it has offset jaws and strong springs. These big traps do not need pan covers; they are big and strong and you can sift dirt or snow right over the trap. All traps are anchored solid; in no case is a drag or grapple used. Wolves can be dangerous and you want to know exactly where it is. Klassen uses long stakes, 3 feet long, made of 5⁄8-inch rebar. Long chains with effective swiveling are important to holding these tough predators. Wolves love fresh, warm meat, of course, but they will not hesitate to return to a kill or accept a free meal when it is available. This can be their downfall. Any wild game or beef will work well for bait, but wolves love beaver meat. It’s like crack cocaine to a wolf. “Wolves would live on beaver meat 100 percent of the time if they could,” Klassen states. When you’re establishing bait stations, a local trapper who can supply you with beaver carcasses can be an important part of your wolf-trapping success. Beaver meat is dark red and rich with a strong smell. Wolves are attracted to the smell of the meat and the associated beaver castor, which calls in all canines with its powerful scent. Wolf trapping has become accessible to many people for the first time. It’s no secret that wolf hunting and trapping is controversial and inflammatory in many circles. It pays to learn the specifics and do it right each time. Each time a trapper makes a mistake it has the potential to flame up into a very tough situation for trappers, hunters and game departments to deal with. I trust this article will put you on your way to trapping your first wolf effectively and humanely. Gordy Klassen does about 25 workshops per year travelling around Canada to help trappers catch wolves more effectively and humanely. He also does a 35-hour course over four days at his camp near DeBolt, Alberta. A third option is a wilderness trapline experience, where you spend time with Gordy on what he calls his Wilderness College. For more information about these options, call (780) 957-3731 or email info@trappergord.com. You can visit his website at www.trappergord.com. 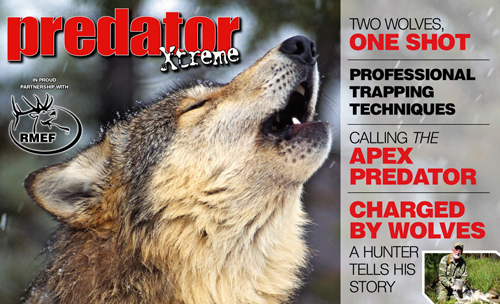 For more wolf hunting gear, tactics, tips, and stories check out the Predator Xtreme WOLF Issue.